Also known as ragù, Bolognese is a thick, full-bodied meat sauce that’s a staple of northern Italy’s Bologna region. 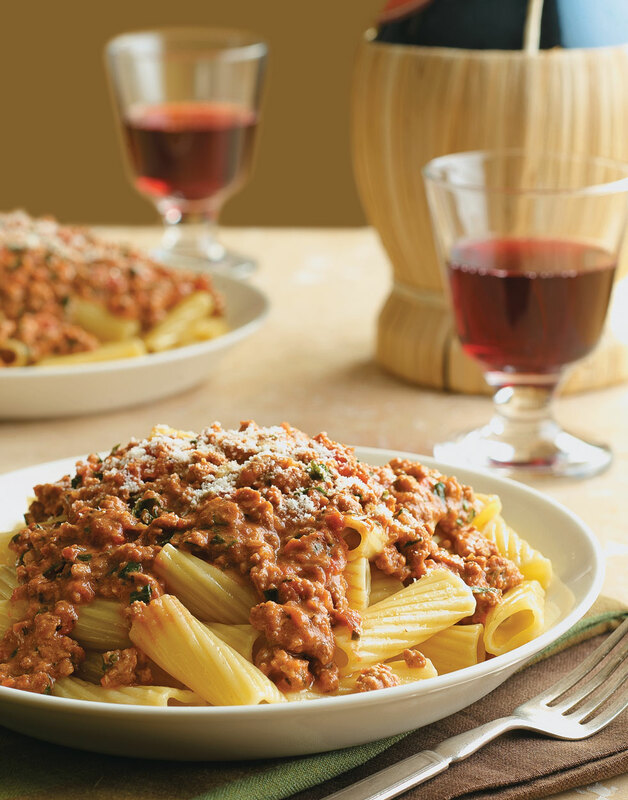 Velvety and rich, this Turkey Bolognese variation is flavorful, filling, and lower in calories than your typical meaty Italian pasta sauce. Usually containing beef or pork and enhanced with milk or cream, it can get heavy. But substituting leaner turkey for other meats, as well as lower-fat cottage cheese and neufchatel for heavy cream, makes a world of difference. This sauce takes some time to simmer down to its final thick, silky texture. Fortunately, it freezes incredibly well. Make it when you have a bit more time, or have a sauce-making marathon, and stock your freezer or fridge. Then, on busy evenings, simply pull out a few servings, reheat, and toss with the pasta of your choice. Though it bears a similar name to Neufchâtel, a soft, white French cheese from Normandy, American neufchatel is more like cream cheese, though it’s slightly lower in fat and calories because of a lower milk fat content. Heat oil in a sauté pan over medium-high. Add turkey breast and sausage, breaking into smaller chunks; cook until browned. Mince onion, carrot, celery, and garlic in a food processor; add to meat mixture and cook until vegetables soften, 5 minutes. Purée cottage cheese in food processor, 2 minutes; stir into meat mixture. Stir in tomato paste; cook 1 minute. Add tomatoes, wine, vinegar, oregano, basil, salt, and pepper flakes. Reduce heat to medium-low; simmer sauce 40–45 minutes, stirring occasionally. While sauce simmers, cook rigatoni in a large pot of boiling salted water according to package directions; drain. Add neufchatel to sauce, stirring until melted, then stir in parsley. Serve sauce over rigatoni. Breaking the meat into small chunks helps achieve this sauce’s signature smooth, velvety texture. Mince the vegetables until they’re fine so there are no large chunks in the finished sauce. Similar to cream cheese but with less fat, neufchatel gives the sauce creamy texture when melted into it.